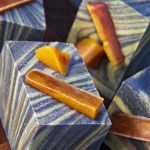 About a month ago, I ordered a bunch of new fall and winter fragrances from Wholesale Supplies Plus. 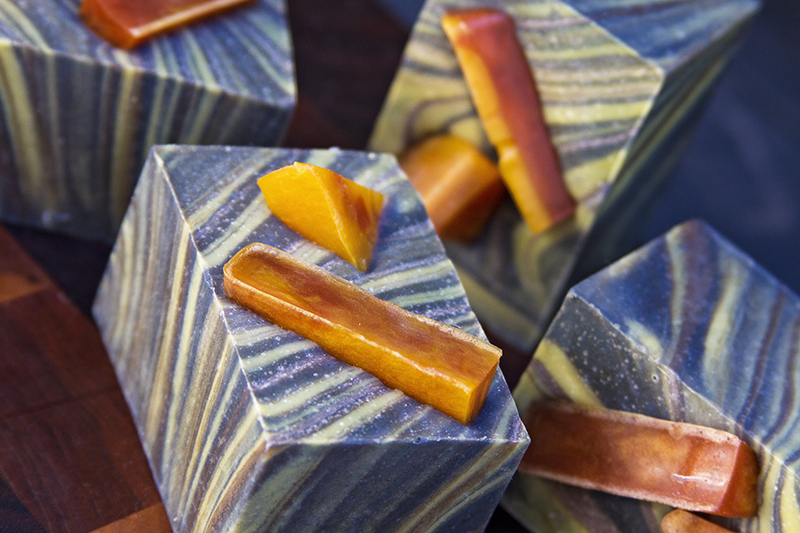 I had no specific designs planned for any of the scents, and I wasn’t even sure which one I would make first. 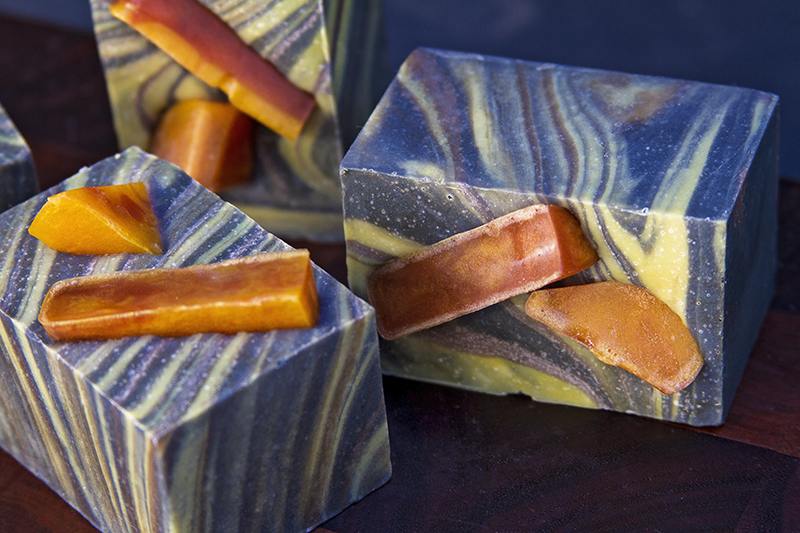 But as soon as I had a chance to smell them all, I immediately had a favorite — Tobacco Leaf Amber. It’s a more masculine scent than I usually choose, and of course, Chris absolutely loves it. If I had to describe it with one word, I’d say “elegant.” There’s a nice earthy, musky top note, but there’s a subtle sweetness on the back end. It’s a very unique fragrance, and I can’t wait to try it out in the shower! 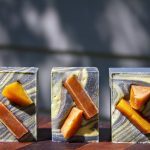 I knew immediately that I wanted to make some embeds for this soap, melt and pour pieces that looked like actual amber. 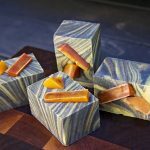 I used a couple of Ikea ice cube and ice stick trays to make some squares and long rods of melt & pour amber pieces, then used a regular kitchen knife to rough cut them into chunks. It took some experimenting to get colors I was happy with, but the end result turned out beautiful! 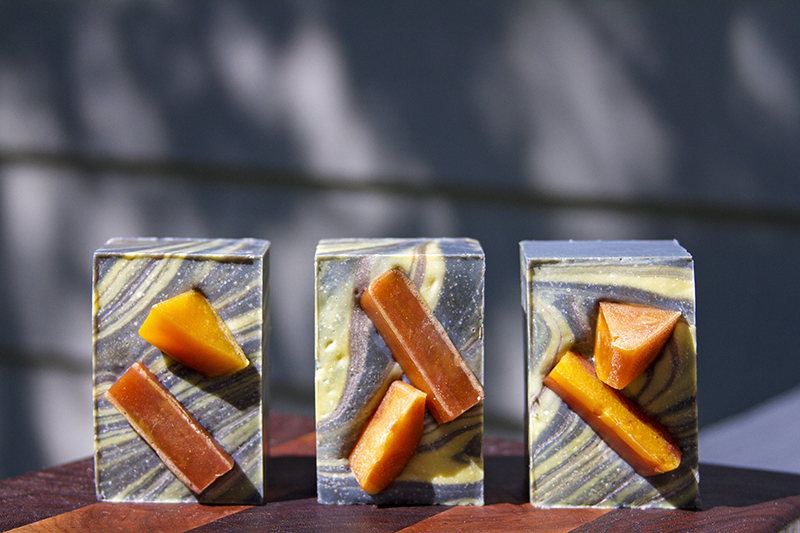 For the base soap, I used my fairly new 18-bar slab mold with dividers from Bramble Berry. 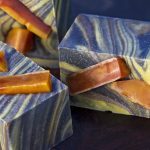 I used primarily activated charcoal to get a rich black color, and I swirled in some subtle threads of brown with a pop of yellow. I was pleasantly surprised when I unmolded this one. It almost looks like a wood grain! That was completely unintentional, but the design works perfectly with this fragrance. I’d actually been wanting to try a wood grain look for awhile, and I managed to get it completely by accident. 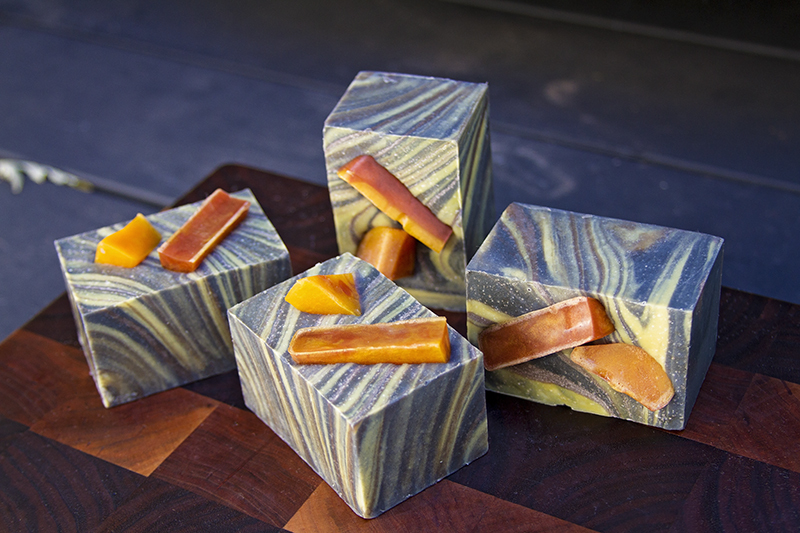 If you have any questions about the soap making process or have suggestions for future projects, let me know in the comments below. I’d love to hear from you!